Amsterdam to Paris or Paris to Amsterdam by bike and everything in between! Bike Europe, from the canals of Amsterdam to the Eiffel tower of Paris! These two European cities of historical proportions, world-famous buildings and varied museums are the start and the finish of this journey through three countries. And throughout, famous and beautiful towns like Gouda, Antwerp, and Ghent will thrill you as you cycle through varied landscapes. 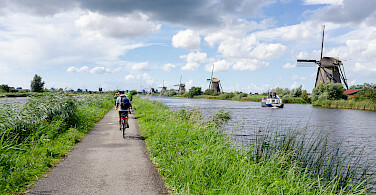 Biking in Holland is a paradise, with water, windmills and a perfect cycle path system. Medieval cities and villages in Belgium will enchant with art and architecture, not to mention great food, beer, and chocolate. And then of course France, beautiful France, need we say more! 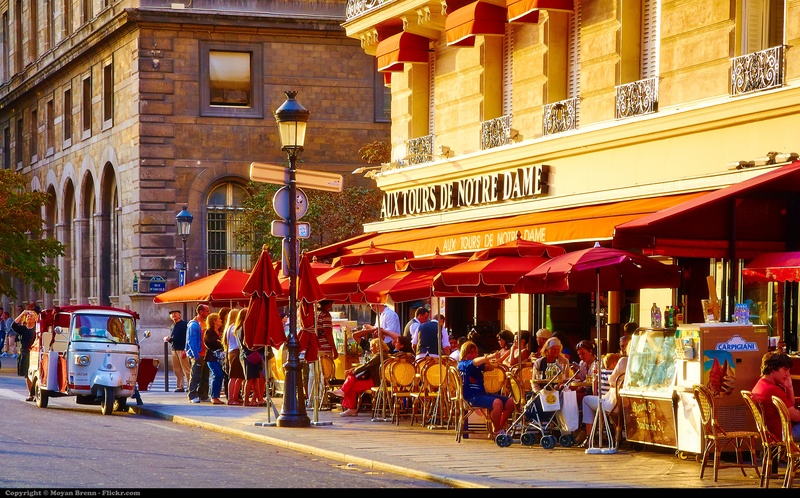 This is tour where nature blends with the urban as you cycle towards the 'piece de resistance', or the finishing touch, Paris "The City of Lights". 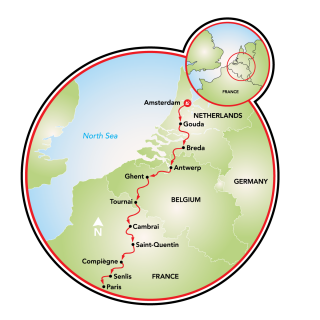 Check out our other bike tours in Holland and in France! Your tour begins in Amsterdam or Paris. 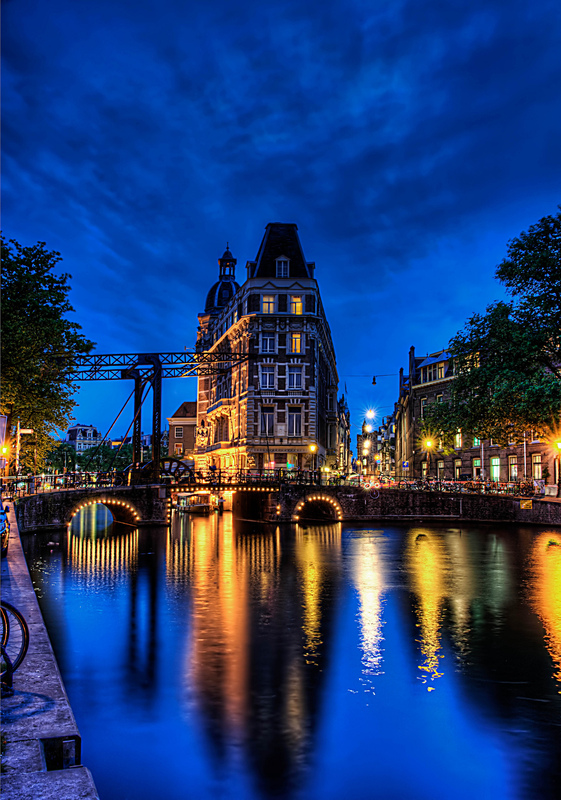 Closest international airport to Amsterdam is Amsterdam Schiphol International Airport and to tour start in Paris, Paris Charles de Gaulle International Airport. 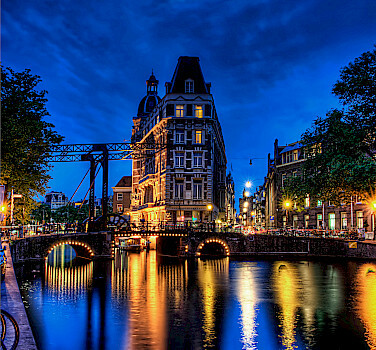 From the Schiphol airport in Amsterdam(AMS), you can take the train to Amsterdam Central. Tickets can be purchased at the ticket counter in the Arrival’s Hall of the airport, or at ticket machines located in the airport terminal (NS train station). From there you head down the escalator to the train terminal. The train ride from the airport to Amsterdam Central takes about 15-20 minutes and costs only a few Euros. Tour start Paris with arrival at Paris Charles de Gaulle From CDG you can take the TGV 2 to Paris Nord and then subway from Gare du Nord to Laumière. The first hotel is then within walking distance. As well, you can fly into and out of the same airport, either Paris or Amsterdam. There is a fast train (Thalys) that connects both cities. Travel time, 3 hours and 17 minutes. Be sure to check local conditions before your arrival. A good website to use when researching local weather is weatherbase.com. Here you will find average high/ low temperatures, average rainfall, and other information related to the weather. Before you travel, please check your country's passport and visa requirements and the passport and visa requirements of the country/countries you plan to visit. Be sure your passport has sufficient blank pages and is not due for renewal. For US citizens, the U.S. Passports & International Travel website is a good source of information. The Country Information Tab provides details about passport validity, blank passport pages required, etc. It is your responsibility to insure that you have obtained all necessary documentation. In Holland, and most of Belgium, along the river, the cycling will be very flat other than the ascents going over a bridge or dyke. However, the wind is a factor to be considered while cycling in Holland. In northern France you will find some hills, not steep but longer slopes of a couple of kilometers. Closer to Paris, you will encounter short hills. The daily distances are not meant for the occasional rider! You should be well trained and saddle ready for this tour. 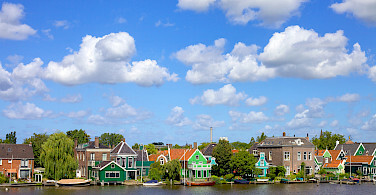 Your cycling holiday starts in Amsterdam, one of the crown-jewels of Europe. 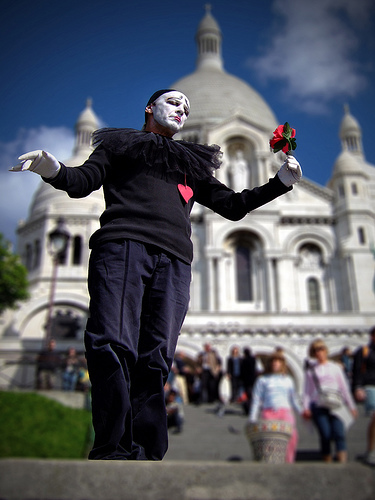 With so much to see and do, you couldn’t wish for a more vibrant way to kick off your holiday. If you arrive early, make sure to go for a walk to marvel at the townhouses in the17th-century canal district (listed as World Heritage). Have you got time and energy left? 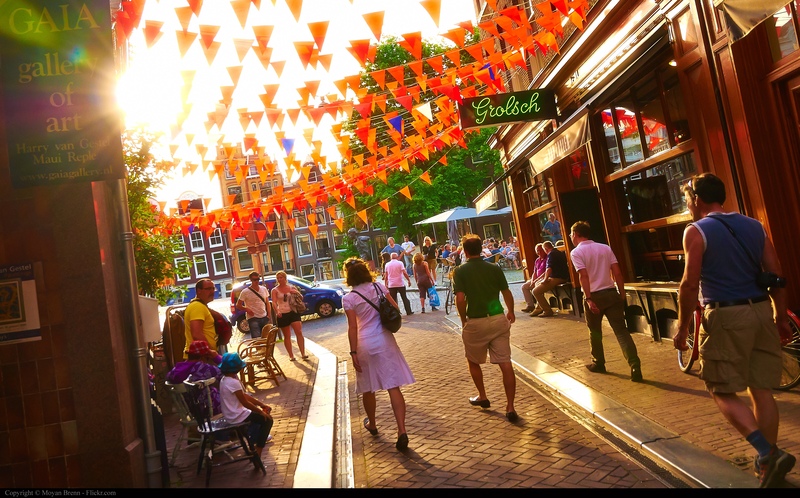 Opt to saunter down the infamous red-light district which attracts millions of curious tourists every year or enjoy the street performers on friendly Rembrandtplein. 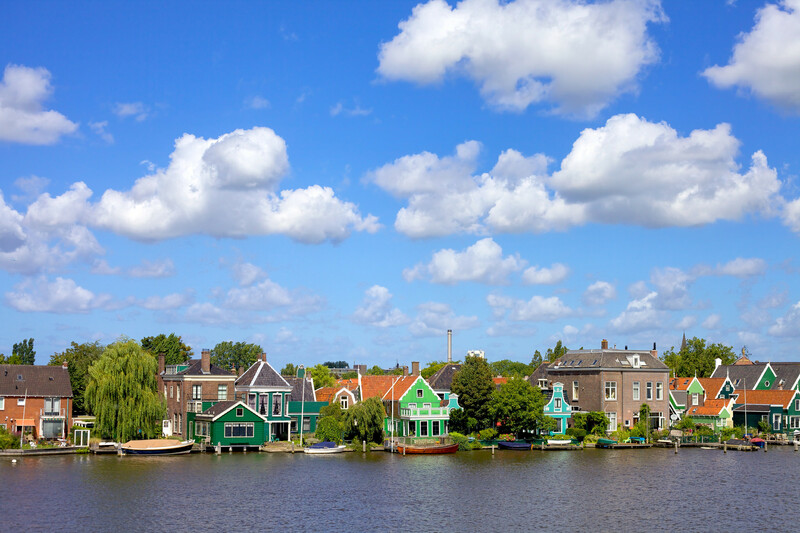 The first leg of the route takes you through the Green Heart of Holland, abounding in water. 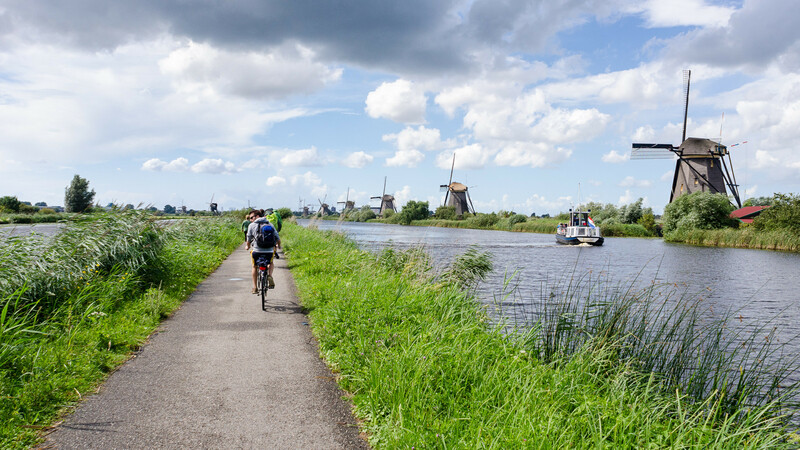 It is a true cycling paradise, with characteristic peat and polder landscapes, small farming communities and picturesque historical towns such as Oudewater. It was to this place that women who had been accused of witchcraft fled from all over Europe to prove their innocence by "weighing". The Witches Weighhouse in Oudewater became famous for its refusal to participate in the delusions about witchcraft. All of the so-called witches who were ever weighed here were not found to be too light, and were thus not sentenced. 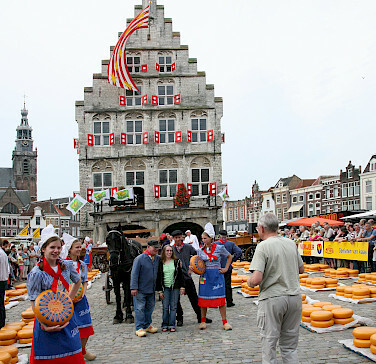 End the day in medieval Gouda. Amble through the beautifully preserved town center and visit the old town hall and St. John’s church. Stop off at a bakery to buy fresh syrup waffles (Gouda is the hometown of syrup waffles) and Gouda cheese - perhaps the world’s most famous type of cheese. 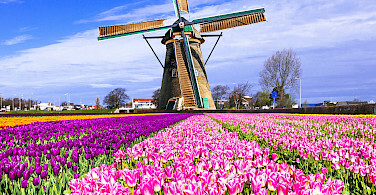 Today’s highlight is one of the Netherlands’ most popular tourist attractions, Kinderdijk, a world-famous complex of windmills. Nineteen historical windmills reach to the skies in the epitome of classical Dutch countryside. You can visit an authentic workshop and find out how these mills were built and how they work. Have you always wanted to be a miller? This is where you can still learn the trade! You will cycle through Dordrecht, one of the Netherlands’ oldest towns. 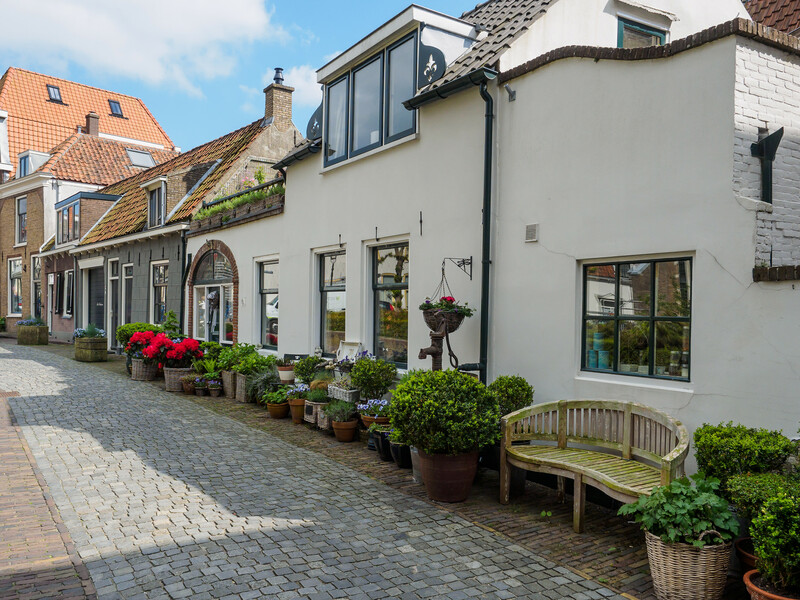 A visit to the scenic harbor quarter with its wonderful historical buildings should not be missed.The route will take you right past one of the few remaining fresh-water tidal areas in Europe, Biesbosch National Park. Upon crossing a one-kilometre-long bridge high above Hollands Diep river, you will find yourself in the south of the Netherlands. 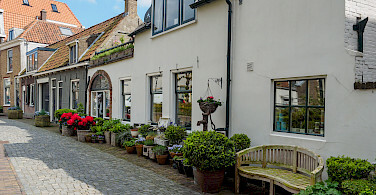 In village after village, Brabant hospitality will entice you to stop for a cup of coffee and big slice of fruit tart. 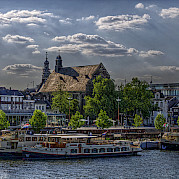 Today’s destination is Breda. Breda is the main city of Nassau in Holland boasts of many imposing monuments. The ancestors of the royal family converted Breda to a beautiful city with richly decorated buildings. The landscape along today’s cycling route is predominantly woody. On the border between the Netherlands and Belgium, catch your breath in De Zoom - Kalmthoutse Heide, a lovely cross-border nature reserve. 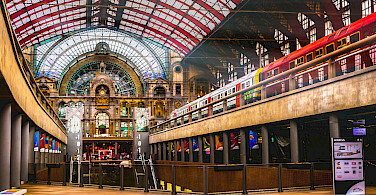 The route takes you right into the historical and touristic heart of Antwerp. 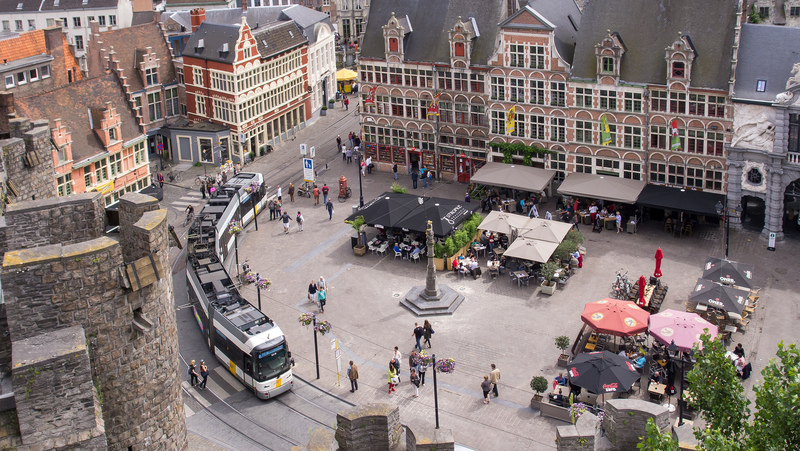 It’s the largest town in Flanders and Belgium’s most important port city. 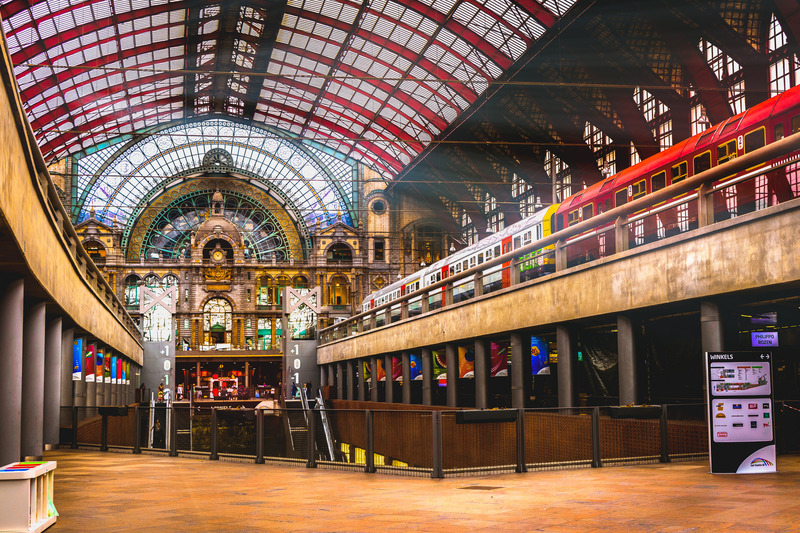 After viewing the historical town center, you might like to venture to the hip and trendy parts of the city, ‘t Zuid and Het Eilandje and work up a thirst for Belgian beer! Consider visiting De Koninck brewery. It has been going strong since 1833 and has a new visitors center for tastings. This brewery is best known for its ‘Bollekes’. Cycling South, along the banks of the river Scheldt, you will start on the LF2 Cities Cycle Route. By switching to the LF5 you head towards Dendermonde and Ghent. The bushes and polders showcase the wild and pure nature here. 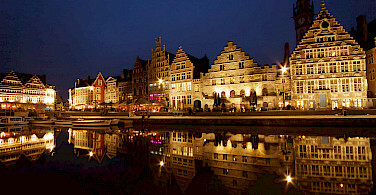 At the end of the day the sparkling cultural city of Ghent is waiting for you. 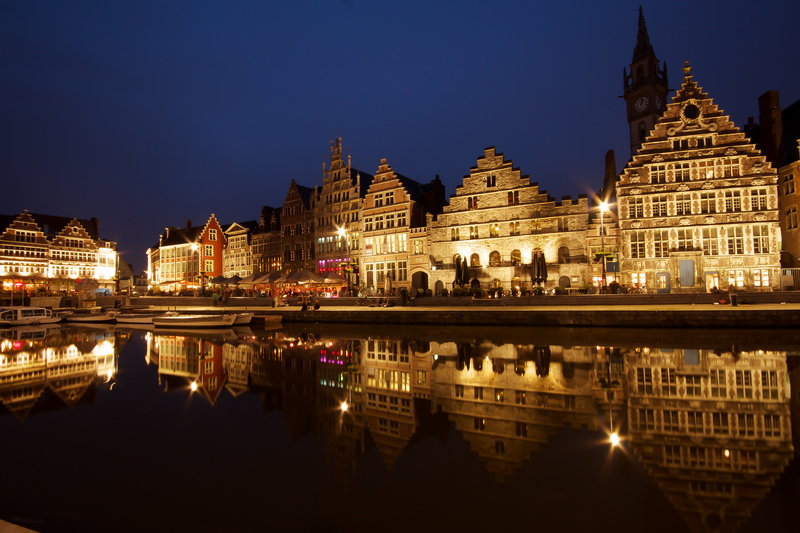 The Belgians call Ghent their most beautiful city and the city will undoubtedly charm you. You continue to cycle alongside the river Scheldt to the old town of Oudenaarde (AD 974), home of the famous classic cycle race "Ronde van Vlaanderen". The former towing paths along the banks have been transformed to smooth cycle paths through the open fields of Flanders. Down the road do try one of the most famous Belgian local products "Geraardsbergse mattentaart", a small, round, curd cheese pie. Directly after Kluisbergen you leave Flanders and you will enter the province of Wallonia with just a 20 km to go to Tournai. Two alternative routes are also offered today that go through the Flemish Ardennes, if you don't wish to cycle along the river the entire day. While leaving the 5 bell-towers of Tournai behind you, ride the last on the Belgian cycle path along the Scheldt, before arriving in France. This day offers a pleasant ride to the Parc Naturel Régional Scarpe-Escaut, the first French regional park. Here, Belgium and France link with the barges on Escaut river, between lands and waters where you pedal through to the forests, marshes and ponds populated with various species. You will discover the mining villages classified by UNESCO, the agricultural landscapes, but also the beautiful city of Saint-Amand-les-Eaux, thermal station, near Valenciennes. 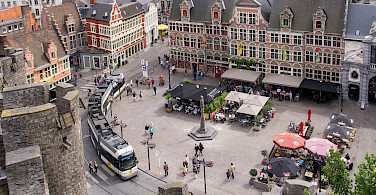 Passing through typical villages and hamlets, you reach the town of Cambrai, peaceful city of Art and History. Take advantage of it to discover its streets, where half-timbered houses, rich private mansions, Flemish mansions mingle with pleasure. And don't leave without having tasted the famous "Bétises de Cambrai" or other local specialties! If you wish to visit Saint-Amand-Les-Eaux, you can take the longer route (79 km). This route is approximately 5 km longer than the standard route. Today, you leave Cambrai by lodging the Canal de Saint-Quentin (inaugurated in 1810 by the Emperor Napoleon 1st), discover the Haute Vallée de l’Escaut. Here is a jewel: the abbey of Vaucelles (XII century). As it is presented to you today, the abbey remains an unusual construction both in its dimensions and the quality of its restoration. A few pedaling strokes and you pass the sources of l’Escaut, the famous river that you follow for kilometers and whose course flows into the North Sea in Netherlands. If you want, you can take the 6 km longer route to visit the interesting canal tunnel and the Touage museum. The route takes you through small hilly roads between villages devoted to agriculture and memorial sites of the Great War: cemeteries, memorials and vestiges of the Hindenburg line. Find the canal and its cycle path to finally reach Saint Quentin. Discover its streets with Art Deco houses, the details of which deserve to be observed. It is the style adopted during the rebuilding of the city, though hardly destroyed during the Great War. 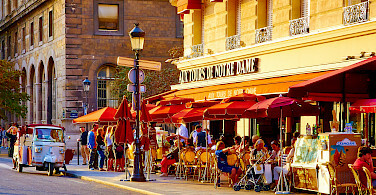 Afterwards, it once again became a dynamic city, the economic capital of Haute Picardie. On the way to Compiegne, cycle through the fertile valley of the Oise. The itinerary again leads along the cycle path of the canals, to the discovery of Chauny. You cross vast natural areas with more than 200 species of birds. Cycle towards Noyon where the route continues along the canal. Noyon is listed as a city of Art and History; a medieval atmosphere around the cathedral where the coronation of Hugues Capet took place in 987. Then return to the shared tracks where a stop at the abbey of Ourscamp is recommended. When cycling through the woods of Compiègne, you will go past the "Clairière de l'Armstice", where the armistice (and the actual end) of the First Great War was signed. Then in 1940, Hitler, as revenge, forced the French to sign the surrender treaty during World War II. Your destination for today is Compiègne, a large town bordering the forest, furrowed by charming and shopping streets and museums with varied collections. The program today includes a prestigious castle, medieval towns, and large forest. Your journey starts in the forest of Compiègne to cycle via Pierrefonds and its enchanting castle to the abbey of Saint Jean aux Bois, with its well preserved abbey grounds, city gates, and 850 year old oak tree. The route continues alongside a number of Gallo Roman ruins to the Automne Valley, followed by the climb to the beautiful village of Néry. Via the forest of Halatte you’ll arrive in Senlis. If you'd like to cycle a little more, you can add an additional 15 km through the forest of Halatte via Chantilly to Senlis. 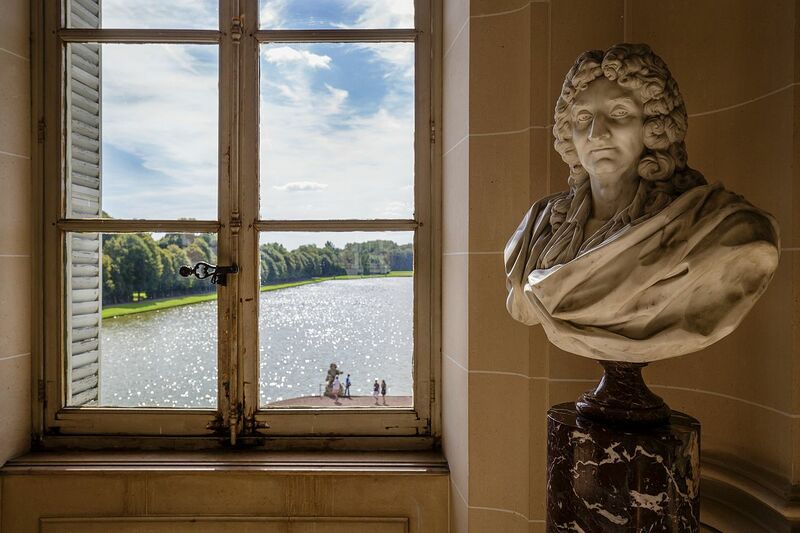 Chantilly is known for its castle (sometimes compared to a castle of the Loire), its Great Stables, its porcelain, its lace and its gastronomy (Yes! the famous Chantilly cream was invented here!). 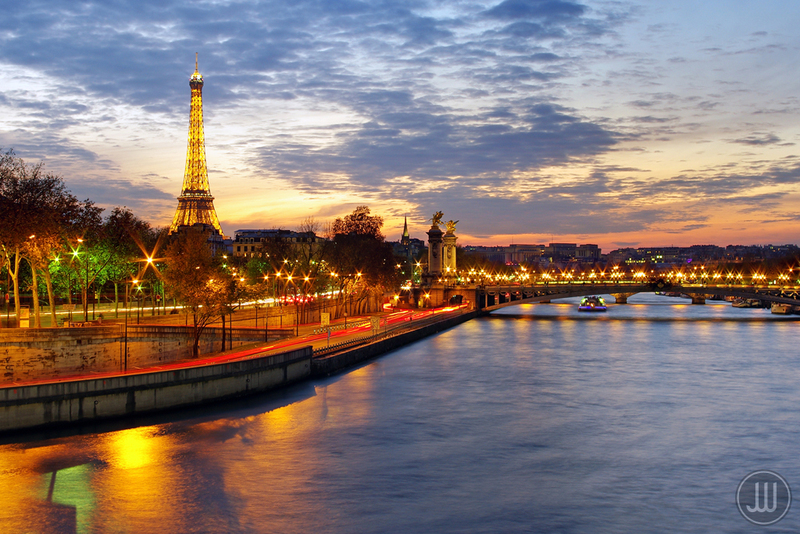 The last day by bike before arriving in the City of Light, the culmination of your journey! Leave Senlis and cycle in the forest for an itinerary in the heart of nature. From Gressy to Paris, the route follows the nice cycle track of the Canal de l’Ourcq, a rural setting on the last 30 kilometers for a safe entrance into Paris, far from traffic! If you have energy left, you can cycle an optional 24 km and safe route through the city. Your hotel is your starting point. 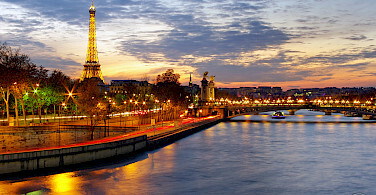 The route goes along the river Seine (and the Notre Dame) towards the Eiffeltower and back. book, an open-air museum. On the first 30 kilometers from Paris to Gressy, the route follows the nice cycle track of the Canal de l’Ourcq, a rural setting away from cars, for a safe exit out of Paris. As you get closer to Senlis you will encounter forests and true nature as you reach the region “Ile de France”, a guaranteed change of scenery with these great pines and this sandy soil in the Landes, south west of France. museums. Its protected environment of 40 ha is particularly appreciated by filmmakers. After crossing the forest of Halatte you cross the "plateau" of Nery but the ascent is mild. You pass close to Béthisy-Saint-Pierre which is worth a detour. After going down the Automne river which gave its name to this valley, called the 35 bell-towers, today’s journey ends the in the forest of Compiègne. A large town bordering the forest, a palace opening towards wooded immensities, these are the first impressions that Compiègne leaves. 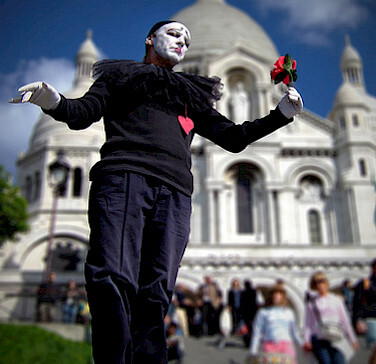 The city, furrowed by charming and shopping streets, has museums with varied collections. In the morning, it is recommended to make the abbey of Ourscamp your first stop of the day. The route continues along the canal, toward Noyon. Noyon is listed as a city of Art and History; medieval atmosphere around the cathedral which saw the coronation of Hugues Capet in 987. Further along the route, you cross vast natural areas with more than 200 species of birds and cycle through the fertile valley of the Oise before you reach Saint Question. 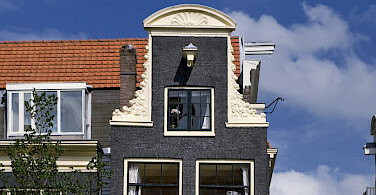 Discover its streets with Art Deco houses, the details of which deserve to be spotted. It is the style adopted during the rebuilding of the city, which was hardly destroyed during the Great War and once again became a dynamic city, the economic capital of Haute Picardie. The route in the morning takes you towards the Touage Museum, through small hilly roads between villages devoted to agriculture and memorial sites of the Great War: cemeteries, memorials and vestiges of the Hindenburg line. A few pedaling strokes and you pass the sources of l’Escaut, the famous river that you follow for kilometers and whose course flows into the North Sea in the Netherlands. In the Haute Vallée de l’Escaut lies a jewel: the abbey of Vaucelles (XII century). As it is presented to you today, the abbey remains an unusual construction both in its dimensions and the quality of its restoration. 1833 and has a new visitors centre welcoming guests wishing to look around and do some tasting. This brewery is best known for its ‘Bollekes’. The landscape along today’s cycling route is predominantly woody. On the border between the Netherlands and Belgium, catch your breathe in De Zoom - Kalmthoutse Heide, a lovely cross-border nature reserve. Upon crossing the border, you will find yourself in the south of the Netherlands. In village after village, Brabant hospitality will entice you to stop for a cup of coffee and big slice of fruit tart. The route today will take you right past one of the few remaining fresh-water tidal areas in Europe: Biesbosch National Park. You will cycle through Dordrecht, one of the Netherlands’ oldest towns and a great place to stop for a lunch break. A visit to the scenic harbor quarter with its wonderful historical buildings should not be missed. 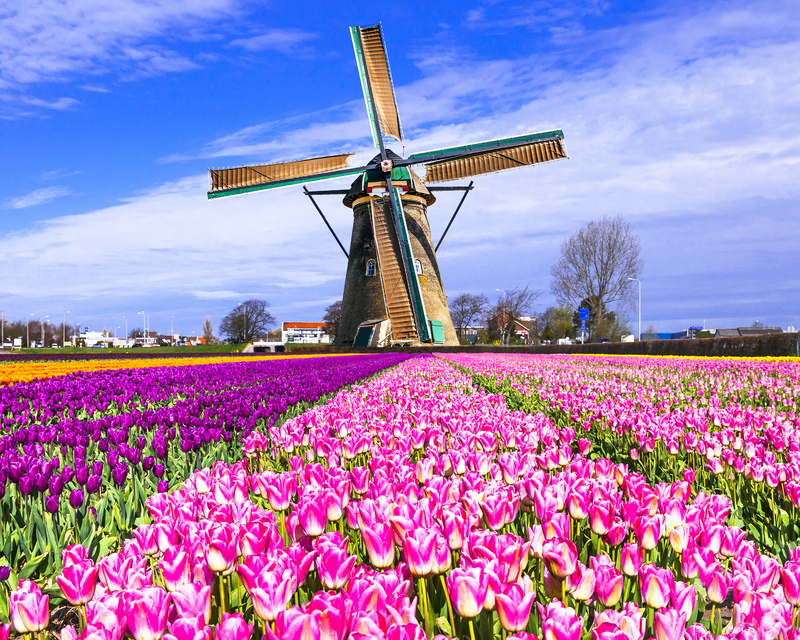 Today’s highlight is one of the Netherlands’ most popular tourist attractions: Kinderdijk, a world-famous complex of windmills. Nineteen historical windmills reach to the skies in the epitome of classical Dutch countryside. You can visit an authentic workshop and find out how these mills were built and how they work. Have you always wanted to be a miller? This is where you can still learn the trade! 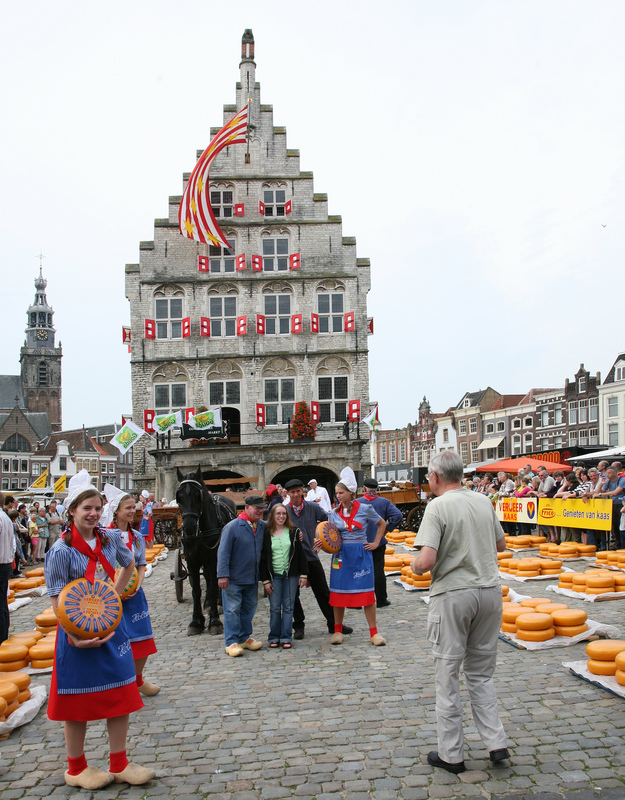 End the day in medieval Gouda. Amble through the beautifully preserved town centrer and visit the old town hall and St. John’s church. Stop off at a bakery to buy fresh syrup waffles (Gouda is the hometown of syrup waffles) and Gouda cheese - perhaps the world’s most famous type of cheese. more exciting way to end your holiday. 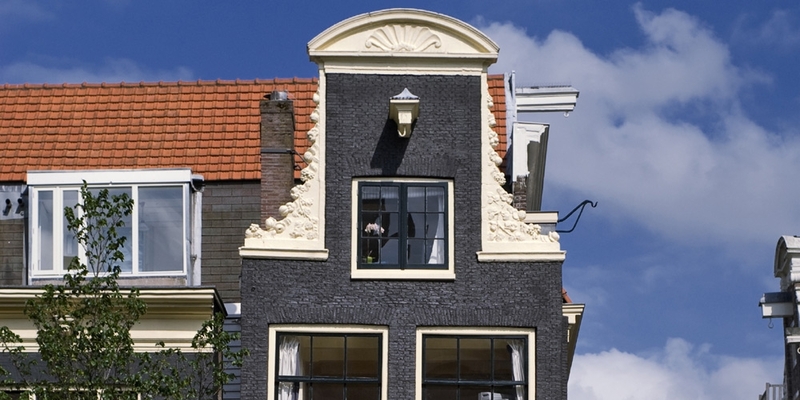 Make sure to go for a walk to marvel at the townhouses in the 17th-century canal district (listed as World Heritage). Have you got time and energy left? 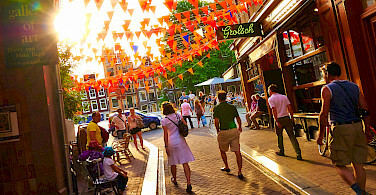 Opt to saunter down the infamous red-light district which attracts millions of curious tourists every year; or enjoy the street performers on friendly Rembrandtplein.